Want to do kendo, but don’t have a Bogu? Gi? Hakama? Shinai? Most of our club equipment is ordered from E-mudo, and we usually do a bulk order at the beginning of the year for all of our members. Beginners are advised to get a uniform set (gi+hakama), shinai (38 if you are female, 39 if you are male), and a shinai bag. Unfortunately, we do not rent out uniforms. 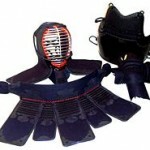 So, if you’re just starting kendo, the only option for you is to make a small investment (buybuybuy!). However, if you are an experienced Kendoka and, for some reason, don’t have Bogu with you, we have a few sets (in a vareity of sizes!) that can be rented at the low, reasonable price of $50* per semester. We also have club shinai that can be borrowed (free of charge*) during practice, just in case you run all the way to FitRec and realize you’ve left yours at home (uhoh). This is meant for short-term/per practice borrowing only. *All prices/fees are subject to change without notice. Contact any E-board member for updated information.